In financial difficulty? Needing direction? Feeling lost? In need of healing? Hurting? Grieving? Anxious? Worried about the future? Then come and lay your burdens down at the feet of the One who cares for you. 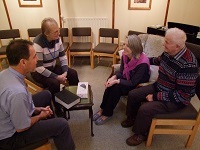 Every Wednesday from 2:15-3:45pm our prayer rooms are open for those in need of prayer. There is no need to book an appointment, just turn up and two people from the ministry team will pray with you.